In their first IPL final, Sunrisers Hyderabad showed their intent early by opting to bat against Royal Challengers Bangalore at a venue where tall scores have been chased down nonchalantly. David Warner, their captain, top-scored with a 38-ball 69, before Ben Cutting finished the innings with an unbeaten 15-ball 39 to help them post 208 for 7. 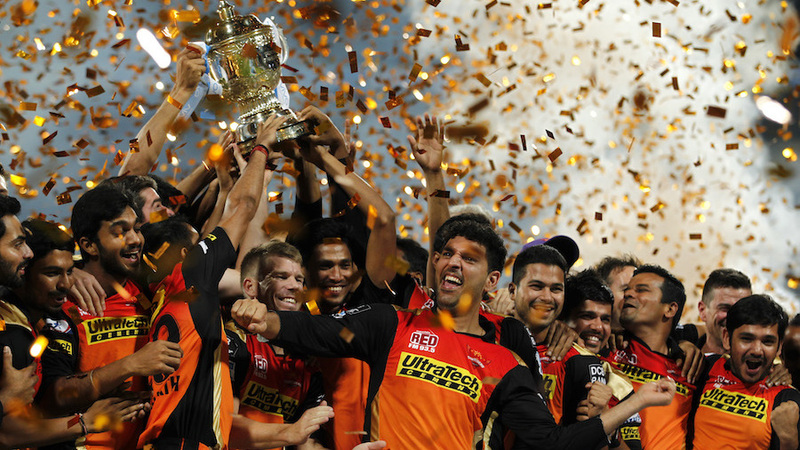 Eventually, however, it was Sunrisers' bowling attack, the best in the tournament, that delivered their maiden IPL title with an eight-run win at the M Chinnaswamy Stadium. Royal Challengers had passed 200 three times previously at home this season and there was no reason why they could not do so again on Sunday, except the pressure of chasing in a final. It did not affect Chris Gayle and Virat Kohli, though, as the opening pair wiped out 114 in 10.3 overs. Gayle alone contributed 76, with four fours and eight sixes. Sunrisers' attack was under pressure, but they clinically applied the brakes after Gayle's wicket.